Not to be outdone by Curiosity, the Opportunity rover has made one of its most significant scientific discoveries to date. A recent analysis of clay minerals indicates that neutral water once existed on Mars — water that could have been suitable for life. It’s an important discovery — and one made by an amazing little rover. Though it was only designed for a 90-day mission, Opportunity is now approaching its 3,400th day of operation. 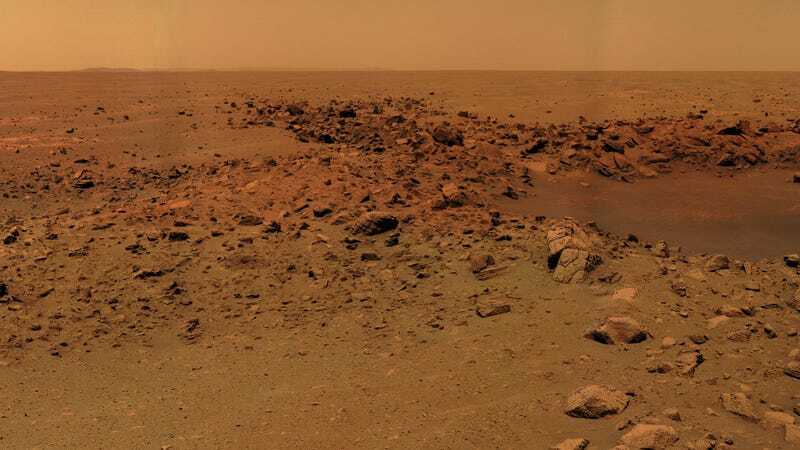 It arrived on Mars over nine years ago on January 25, 2004. Recently, however, Opportunity has been overshadowed by its kid brother, Curiosity. But this latest development has once again propelled it to the limelight. The clay minerals were found near Endurance Crater in a rock called Esperance. These minerals, which are similar to montmorillonite, form under the influence of neutral water — water that’s very similar to tap water and potentially very friendly to life (i.e. water neutral in pH). Today, with Mars largely taking on the characteristics of a vast desert landscape, any residual water would have turned acidic. Evaporation of the water has left higher concentrations of minerals, thus contributing to its current acidity. "What we have here is a very different chemistry," noted lead scientist Steve Squyres during a press briefing on Friday, according to Discovery News. "This is water you can drink. This is water that was probably much more favorably in its chemistry, in its level of acidity, for things like pre-biotic chemistry, the kind of chemistry that could lead to the origin of life." "This is the most powerful evidence for neutral chemistry water that has been found by Opportunity," he said. Earlier this year, Curiosity found evidence of neutral, slightly salty water in clay minerals at the Gale Crater site. Consequently, a picture is emerging of ancient Mars in which neutral water existed at multiple locations, quite possibly raining down from the sky. Over the course of millions of years, Mars has gotten progressively drier and colder, resulting in highly concentrated pockets of acidic water.